The Fellowes Powershred 69Cb Cross Cut Paper Shredder is perfect for single users in a small or shared workspace environment. Thanks to SilentShred technology, the 69Cb shredder runs whisper quiet. It can shred 10 sheets per pass into 5/32" x 2" cross-cut particles, and run for 10 minutes of continuous shredding. The 69Cb is an ideal shredder to have for personal security, as it can also handle credit cards in addition to paper, staples and paper clips. Safety features include Jam Blocker technology, alerting the user to a paper jams before it starts, and Safe Sense technology, which stops the shredder when hands touch the paper opening. Quiet and easy to use, the Powershred 69Cb makes a great addition to any small office. Cut Size: 5/32 x 2"
Item H x W x D (inches): 20" x 10" x 18.4"
While there are many shredders at retailers and office supply stores, many of them are simply not good enough to handle any kinds of volumes of documents. The Powershred 69Cb Cross-Cut Shredder can handle plenty of documents at one time (up to 10), and it does so with ease. Add in the fact that its pretty quiet compared to others, and you have a solid unit for a home office or just personal document shredding. A solid buy! I truly recommend this product for small Offices and homes. Completely safe if you have young children. Everything they said it would be, great product. I Recommend it . 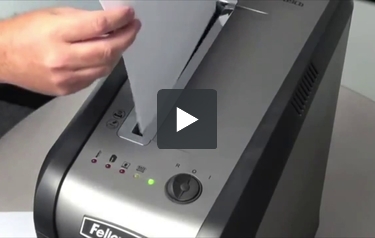 We just started using Fellowes 69b shredder and it's been working well. We had another shredder for years, but had several jams that took time and work to clear. So far we've had no problems with the Fellowes shredder and we shredded a variety of materials. This thing is amazing! It shreds credit cards, staples and even small paper clips. Much quieter than my last one that burnt out in 6 months. I love the removable basket, very convenient and less messy. I have used other shredders in the past and they always overheated. With the other ones I would have to clean some of the shredded paper out of the "teeth" because they would jam up. The other ones were real loud also. This shredder is much quiter, does not jam, and has never overheated. I am very happy with this shredder. Does what it is designed to do. It is fairly quiet. Check it out. I've gone through several shredders in the past few years and this one seems to be in it for the long haul. I just purchased a Fellowes 69Cb Cross-Cut Shredder and I love it. It was one of the only shredders that I could find with a narrow design, perfect for under or on the side of a desk. It is more than powerful enough to handle its 10 sheet rating. The instructions are clear and easy. I had a question about oiling the shredder and it was answered with one quick scan of the manual. I definitely recommend this product for any home or small office. I love this 69Cb cross cut shredder. It is a bull dog! I have worked with lots of shredders over the years and can see why it should be a 5 star rating. I shredded 10-15 trash bags of paper and it stood up to all the performance capabilities listed and would recommend it to all my friends! Customer Service also gets a 5 star rating. They were patient and went above and beyond in making sure my product was registered and had NO NO NO defects! Good customer service is hard to find and it makes the purchase experience all the more worthwhile. Thank You for such an awesome service. Hi, I'm Mitch, and this is the 69Cb from Fellowes. This ten-sheet cross cut shredder can shred staples, credit cards, and paper clips. It includes a five-gallon pull out bin and it can shred continuously for ten minutes before requiring a cooling down period. The 69Cb has several unique features. First, jam blocker technology blocks jams before they start by preventing the shredder from taking in more paper than it can handle. Simply remove excess paper to resume shredding. The 69Cb also features patented SafeSense technology, which stops shredding automatically when hands get too close. This shredder also includes silent shred technology, making it ideal for deskside use. Again, this is the 69Cb from Fellowes, manufacturers of the world's toughest shredders. The Powershred 69Cb will give you a lot of security because it's a cross-cut shredder. It produces shreds that measure 5/32" x 2" so you can be sure that your private information won't get out into the open. Also, the machine can shred credit cards so you will be able to dispose of them safely. This shredder can shred up to 9 sheets at a time and it can run continuously for up to 10 minutes. It will also start shredding automatically. Also, the machine's cutters can tear up staples and paper clips so you won't need to waste time removing them from your documents. The Powershred 69Cb has jam blocker technology that helps prevent paper jams. This feature helps ensure that you will rarely need to deal with a paper jam. Also, the machine has a SilentShred feature that allows you to shred without making a lot of noise and distracting the people around you. This machine is one of Fellowes' many devices featuring SafeSense technology. This feature can detect when your hands are too close to the feed opening. When this happens, the feature will disable the shredder so you can remove your hands and avoid injury. If you don't have a lot of space in your work area, you'll be glad to know that the Powershred 69Cb isn't very big. Its approximate dimensions are 20" (height) x 10" (width) x 18" (depth) so it can fit just about anywhere. There are casters on the bottom of it so you can move it around easily. This shredder has 5-gallon waste bin that pulls out for easy disposal. There is a window in the bin so you will be able to tell when it's time to empty it. Also, the machine has casters so moving it around is easy. Finally, the Powershred 69Cb's cutting cylinders are covered by a 5-year warranty. The device as a whole is covered for a year. Although this shredder can run continuously for up to 10 minutes, you will need to let it cool off for 20 minutes. This can be inconvenient when you have a lot of shredding to do. Despite this machine's ability to shred credit cards, it cannot shred CD's, DVD's, and floppy disks. You will need to have a multimedia shredder to get rid of those items. The Fellowes Powershred 69Cb is a terrific cross-cut shredder that can be used at home or in a small office. As you can see, it has a number of strengths including its jam blocker, SafeSense technology, and the ability to shred quietly. Plus, it offers a good amount of security and it's pretty compact. Check out the Powershred 69Cb if it sounds like the right cross-cut shredder for you. Unit Dimensions (H x W x D) 20" x 10" x 18.14" 22.25" x 13.8" x 10.25" 21.25" x 15.5" x 11.3" 20.25" x 15" x 11.25" 18.75" x 13.75" x 10.44"